The Cascade Chapter is excited to announce Ashlie Denton is the 2017 PSU Cascade Chapter Scholarship Awardee. Ms. Denton is a PhD candidate and National Science Foundation Integrative Graduate Research Education and Traineeship Fellow (IGERT) and Institute for Sustainable Solutions Fellow at Portland State University. Her background includes AmeriCorps volunteer in New Mexico, non-profit work at the Hispanic Women’s Organization of Arkansas, Arkansas Advocates for Children and Families and the Community Clinic of NW Arkansas. Through these and other experiences, she has gained insights to the impact and effects of individual engagement in peoples’ lives. This has led to a goal of providing public participation at every scale. Academically she is pursuing interdisciplinary research with the goal to embark in a career in international environmental management. Ms. Denton is the latest in a continuum of outstanding scholarship awardees from Portland State University. Cascade Chapter of IAP2 USA has provided $62,500.00 to date in scholarships in support of future practitioners and advancement of best practices for public engagement. The Chapter stands behind the IAP2 goal of providing community members opportunity to be a part of the decisions that affect their lives. Welcome to IAP2 and to the Cascade Chapter Ashlie! What’s coming next? The Cascade Chapter is convening another of its PI Network sessions on June 22. Donna Maxey, Founder and Director of RACE TALKS will present her research and writing on supporting interracial and cross-cultural communications and relationships through the development of sensitivity and understanding, and social justice activism. The Cascade Chapter also excited to announce it has recently experience a great influx of new members! The Government Membership program has brought to them 50+ new members from Washington County government, 100+ from the City of Portland, and a large number from the regional governing body, Metro! Welcome to the Cascade Chapter! The Intermountain Chapter is excited to announce the upcoming event: “Fostering Productive Dialogue in Divided Times”. From angry town halls with legislators to vitriolic arguments via social media, it is increasingly clear that we live in divided times. Whether these divides are real or perceived, such tensions have the potential to erode our democracy, disrupt our communities, and inhibit public problem-solving at the local, regional, and federal level. Especially on environmental and natural resource issues, this sense of division is often the result of a lack of meaningful dialogue and mutual understanding. Join our expert panelists Carolyn Lukensmeyer from the National Institute for Civil Discourse, and Larry Schooler of the Conversation Corps as they explore what it may take in the way of collaborative-problem solving to bridge the divide. YOU’RE INVITED! The Puget Sound Chapter has announced that they will be hosting and facilitating a National Dialogue Event. This event is part of the IAP2 USA Grab N’ Go National Dialogue designed to answer the question: “Are we facing a P2 Crisis or Opportunity?” What do you think? What are your experiences? This event is open to EVERYONE! From public transportation and facilities planning, to special interests groups and community leaders, come and join the Puget Sound Chapter on June 22nd, 2017 to face this troubling question. IAP2_June 22_EventFlyer – Register TODAY! Kit Cole, Lauren Cobb, Jennifer Trotter, and Scott Woodhill have been spearheading the effort in Southern California to form the Greater Los Angeles Chapter of IAP2 USA. Since the first meeting in June 2014, the emerging chapter has been growing steadily and they now have more than 160 professionals on the invite list. Killer Speakers and Topics – EVERY SINGLE TIME! Because it’s tough to travel around Los Angeles, Greater LA team has found they need a great speaker with a great topic to motivate attendance. A great speaker puts their own twist on P2, and helps promote the event to their audience as well. For example, the Greater LA Chapter’s first meeting was held in a Southern California Edison (SCE) conference room with Genoveva Arellano of Arellano Associates presenting about her agency’s P2 work on a statewide transportation project. Her topic was amazing – how a Latina with a Harvard degree has cornered the market on P2 around transportation projects in Southern California. Another event featured Darrel Cole from Parsons Brinkerhoff presenting his team’s use of social media for better P2. Both speakers – and topics – were a big draw. Get Personal – Use personal invitations and leverage your relationships! The event invite email comes from a personal email address – not an event invite service. Most importantly, for the first few meetings, members of the leadership team got on the phone and personally called people who they thought would be interested in attending. Want to discuss your ideas for starting a chapter or work through your roadblocks? Email Kit (kit@kitcoleconsulting.com) or Lauren (ms.laurencobb@gmail.com) or contact info@iap2usa.org to be connected to the IAP2 USA Chapter Liaison Committee. Awareness of the need for and commitment to enhancing public engagement has been quietly growing in California for some time. Recently, California’s State Assembly formed its first Select Committee on Civic Engagement, chaired by the Assembly Member for the 13th District, Susan Talamantes Eggman. The committee’s first hearing was held December 18th, 2015 in Sacramento. Boldly, Assembly Member Eggman convened the second hearing, held on May 13th, in Southern California at the Los Angeles Public Library’s Downtown location. The hearing offered a remarkable opportunity for members of IAP2 USA’s Emerging Southern California Chapter to attend and meet with policymakers and influencers who are thinking and planning for a more engaged California public. Steve Boilard of the Center for California Studies, who facilitated a lunch discussion at the IAP2 USA 2016 Skills Symposium this past February, and Sarah Rubin of the Institute for Local Government presented on the opening panel describing an overview of civic engagement in California. Grayce Liu, Director of the Los Angeles Department of Neighborhood Empowerment, and Pete Peterson of the Davenport Institute, who have both supported LA’s emerging chapter from the beginning, presented on the second panel, Local and Neighborhood Efforts, offering their powerful experiences cultivating more involved communities in Los Angeles and California at large, respectively. The day’s presentations testified to growing awareness and resources in California for supporting improved and expanded civic engagement – both from the Public and from our public servants. If you are interested in seeing the recorded video of the hearing you can view it here and you can follow the efforts of Assembly member Eggman on her website and Facebook page. On March 10, Cascade Chapter hosted a standing-room-only PI Network titled “Visuals for Public Engagement” presented by Nitya Wakhlu of Drawbridge Innovations and Darren Cools of Darren Cools Illustration and Design. As one who has always envied other people’s natural ability to draw while I find it difficult to create simple stick figures, I never would have believed I could use art to engage and communicate with others. Nitya and Darren want people to know that anyone can use hand-drawn visuals to cut through the noise and make the complex simple. During their presentation, the duo demonstrated how visual communication helps you listen and talk to people across cultural and language differences. As Nitya put it, “visuals speak to the heart.” Graphic recording, also described as graphic listening, uses color and images to capture thoughts and ideas while they are shared. The interactive session showed participants how anyone can use live graphic recording with practice –artistic talent not required. As we sat around the room learning to draw box and bean people, I grew more confident that with practice even I can use some illustrations for storytelling (but I will probably leave graphic recording to the professionals). IAP2 USA Skills Symposium, February 21-25, 2016 – Are you joining us in San Diego? Why would you want to join us? What are your professional development objectives? No matter your training goals we believe that we can meet your needs. Early bird registration continues until December 16th – please note that space in the courses and at our Symposium hotel are limited so register now and avoid disappointment. We are truly excited to be welcoming trainers from around the world to this first class training opportunity. Curious and want to learn more? Check out the 2016 IAP2 USA Skills Symposium! Back in May I had the privilege of attending the 2015 Neighborhoods USA Conference (NUSA) in Houston, Texas. With other Fort Lauderdale staff, all within the Division of Neighbor Support, we conducted a number of workshops on a wide variety of programs that had produced successful community building partnerships within the city’s neighborhoods. The workshops, however, were truly secondary to our real focus at the conference as we were presenting our Adopt-A-Neighbor Program for the Best Neighborhood Program of the Year Award and we were intent on sharing the story of how the program developed and then flourished to make such a strong impact in Fort Lauderdale. In the ballroom, before the judges, we were joined by three other cities that were there to present the programs they had developed and programs equally qualified for the coveted award. One of those cities was the City of Round Rock, Texas. Round Rock, Texas, a city of about 110,000 and located just north of Austin, made a commitment in 2014 to make neighborhood revitalization a top priority. The commitment declared wasn’t so different than that which Fort Lauderdale had made – a commitment that spawned the idea of the Adopt-A-Neighbor Program. Similar to how we approached the idea of community revitalization, Round Rock saw the necessity of bringing the community together to approach this commitment through a unified, publicly engaged force. Their idea was to create a “tool-lending center.” The Tool Lending Center (TLC) works like a mobile library, that is a tool library hitched to the back of truck, where groups are given the opportunity to check out tools for neighborhood projects and then return those tools once they are done with them. The Tool Lending Center is designed to be deployed for organized projects such as neighborhoods cleanups or other beautification projects where volunteers such as scouts, church groups, school groups, etc., are organized and available. Currently, the TLC does not issue tools on an individual basis – probably for the best as it encourages individuals to “team-up” and tackle communal issues rather than those of the abled individual. On all accounts the TLC has been wildly successful in Round Rock. In the program’s inaugural year, the TLC was deployed 20 times with over 800 volunteers contributing 3,300 hours of service. Of the 20 deployments, six were neighborhood cleanups that included 3,173 homes. The cleanups resulted in 209 tons of garbage removed from neighborhoods, and volunteers worked on 72 homes of residents who had a genuine need because of age, disability, or other special circumstances. It should also be noted that the program would not have been made possible if not for the generous donation of Home Depot who donated $6,250 worth of tools. During the City of Round Rock’s presentation for the Best Neighborhood Program of the Year Award at NUSA, they showed a video detailing the program and the program’s success. Throughout the video were people smiling as they came together to help others take on blight. I believe it’s safe to assume that many of the individuals in the video, indeed many of the 800 volunteers that have contributed to the program thus far, don’t always come to city hall meetings on the first and third Tuesday of every month. They don’t go to City Hall to meet with the Mayor, the Council Members, or the City Manager – truth be told, they may not even now the names of their elected and appointed officials. They probably don’t participate in the government process through means which we commonly associate with public participation. Yet, all of the volunteers that have come together through the Tool Lending Center Program, all of the individuals that have built community through sweat and muscle, are public participants and publicly participating in democracy in a joyous, meaningful way. I’ve come to view this type of public participation as the most rewarding. I love the participation where people take time out of their lives to make an impact in others’ lives through hard work and compassionate effort. This is in no way a rebuke of the public participation that takes place in City Hall and shapes policy – participation of that sort is incredibly important for a democracy to sustain itself. However, cities need to start thinking about public participation the way the City of Red Rock, Fort Lauderdale, Birmingham, Alabama, and others have. It’s up to more cities to follow Round Rock’s lead and provide opportunities for individuals to participate in democracy outside the walls of City Hall. Learn more about the City of Round Rock’s Tool Lending Center. 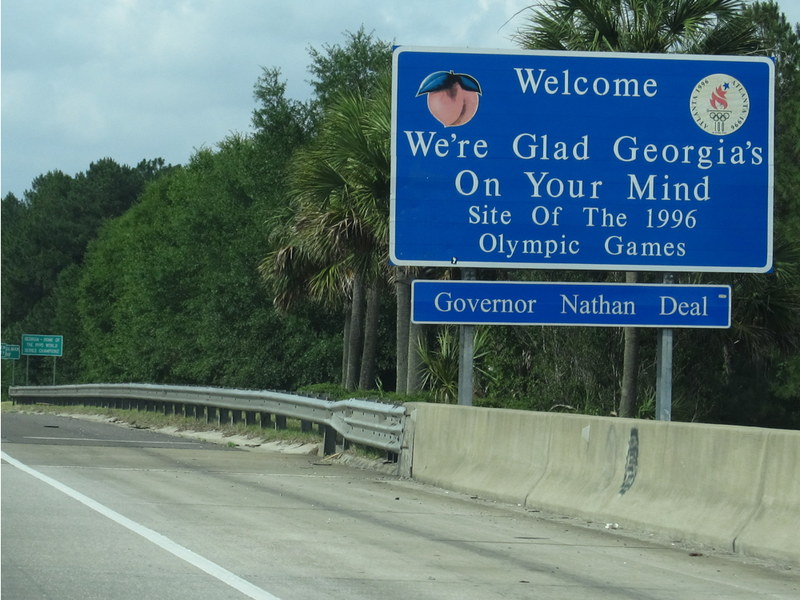 “Welcome to Georgia!” by kenlund is licensed under CC BY-SA 2.0. Great news, everyone! After a year of prep work, our IAP2 Georgia chapter is starting to re-emerge. A small group of long-time public participation enthusiasts in the greater Atlanta, Georgia metro area have decided that the time is right to revive the local chapter there, which went inactive and eventually shut down about eight years ago. Over the next six to twelve months, the team plans to first get a basic level of activity going again in Atlanta, and then from there quickly grow the chapter into a viable hub strong enough to serve the public participation community across the entire Peach State. If you have friends or colleagues in the region who might be interested, please share this opportunity and encourage them to register. For updates, please follow IAP2 Georgia on Twitter and like them on Facebook. The kick-off event takes place alongside the 2015 EPA Community Involvement Training Conference, which will bring into town several hundred practitioners, including a number of current and former Board members of IAP2 USA and a few IAP2 Licensed Trainers from Canada and the United States. The first ten people have signed up. Hope to see you there!